The Zeonic Geofront: John Titor? Marty McFly? The Borg? Kyle Reese? So as we all know something fishy has been going on with the Large Hadron Collider. According to some theoretical Physicists there may be more going on than just some random Gremlins. Not one but Two different essays have been written regarding the possibility that the reason there has been so much trouble getting these things off the ground may be because the future is working against them. 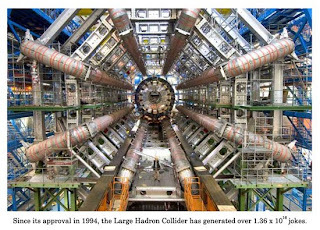 The theory is that discovery/observation of the Higgs boson or the "God Particle" goes so badly that either 1) someone from the future is working to stop its discovery, or 2) the universe itself is working to stop it's discovery.